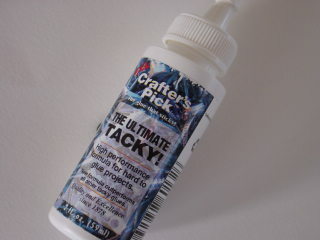 Crafter's Pick works great to glue down ribbon and embellishments. It dries clear and is very easy to work with. Fabiano Paper is beautiful paper. 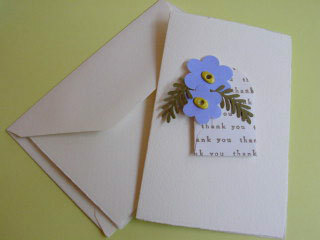 I could easily make every card using this paper. It makes such a statement that you don't need to add much else. That's why I probably love to use it. 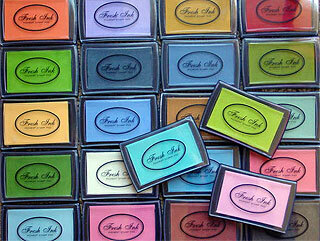 Fresh Ink is an exclusive ink that is sold at Impress. It's a pigment ink and the colors are amazing. Double stick tape. A must for 3-dimensional projects. I use this often for covering a large area with glitter. Sakura Glue Pen. This is a great glue pen, it doesn't clog and works great with loose glitter. This alphabet set stamps very nicely on all types of paper. I like the packaging because it makes it easy to use and is nice for keeping the letters all together. Piercing Tool. I've used this for several years and is great for making very small holes and for several other little tasks. Glitter Glue. I'm always using glitter glue on cards. White pen. It's a white-out pen that works really, really well. It doesn't clog and skip. Ultra-fine glitter. I use this all of the time and either use rubber cement, a glue pen, or glue pad to apply to my project.